Constructed of polyethylene film laminated to cloth with a rubber adhesive, this value tape resists curling and tears off the roll cleanly for simple applications in MRO/construction. Our 3M™ Value Duct Tape 1900 is economically priced to best provide a quick solution for simple tasks. It is removable with little or no adhesive residue up to three months after application. 3M™ Value Duct Tape 1900 is a good choice for light indoor duties where overall strength and durability are not crucial. The economical tape can also be used at temperatures as high as 200°F for up to 30 minutes. Originally developed for heating, ventilating and air conditioning (HVAC) applications, duct tape is used today in a variety of maintenance, repair and construction settings. Due to its unique design and low price, 3M™ Value Duct Tape 1900 is a good choice for light indoor duties where overall strength and durability are not crucial. 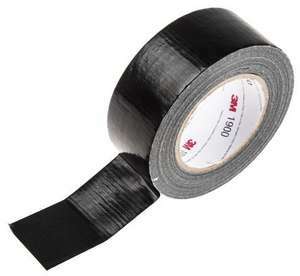 The economical tape can also be used at temperatures as high as 200°F for up to 30 minutes. 3M™ Value Duct Tape 1900 comes with a classic, black-coloured backing. Our sturdy vinyl tape can be torn from the roll and sticks instantly, providing a wide range of convenient solutions. And all these years I always thought it was called duck tape. Got some for the wife. Also available from Amazon at the same price if you've got Prime. £1.99 when it comes round at Lidl, if you're not desperate. 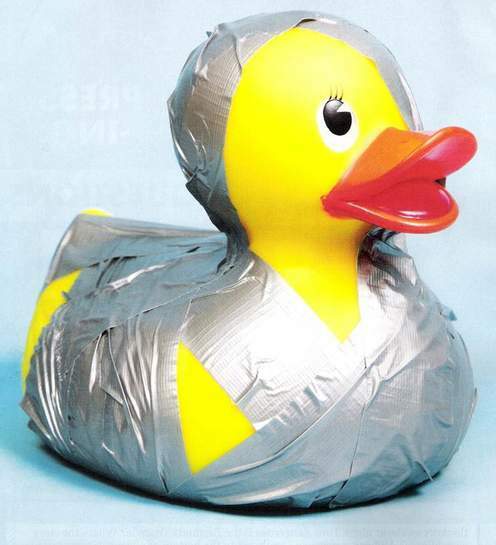 Duck tape is the original brand of duct tape. Do RS sell balaclavas too? 50 Mtrs is the norm for gaffa tape..No? 3M make? 1.99? 50 meters? Aye, £2.49 though last time out..
is the 3M stuff certified for kidnappers? God that's funny. Give yourself a round of applausl. P.S. ...And if you can't get a laugh with a prop I would just 'go mow'. 3m tape is rubbish compared to it's alternatives. Gorilla, T Rex etc.. I'd say that describes it well. Not as strong as a non brand tape I've had in the past. Adhesion is good though. Available for same day delivery from Amazon, at same price for Prime customers. Is this good for parcels? I buy the 2 for £1 Poundland parcel tape, but this looks cheaper. Don't know what eBay customers will think when they see their parcel covered in Duct Tape though! Thanks - and with a £1 digital credit too if you're not in a hurry! £2.99 for a 50m roll. It's not a known brand like 3M or Duck but I can vouch that it is decent quality on par with those - proper cloth tape and good adhesive, not like some of the imitations you get at this price point. Good find, I'm amazed RS don't charge delivery, they used to on small orders and they've never been known to be very cheap as they're aimed at industries that want huge range of stock and fast delivery rather than cut priced service. Is this good for parcels?I buy the 2 for £1 Poundland parcel tape, but …Is this good for parcels?I buy the 2 for £1 Poundland parcel tape, but this looks cheaper. Don't know what eBay customers will think when they see their parcel covered in Duct Tape though! If it's heavy items in a box then maybe but otherwise seems overkill and I'd use parcel tape.... I hate having to open up parcels covered in duct tape! But do you get 50m or 3m length of duct tape.......?? Greatly affects the value of this offer. This isn't a competitor to gorilla tape, 3m make many versions and as stated this is their light duty one. That's like saying a BMW is better than an Astra van. 32m of Gorilla tape will set you back about £7. But do you get 50m or 3m length of duct tape.......?? Greatly affects the …But do you get 50m or 3m length of duct tape.......?? Greatly affects the value of this offer. Click on the link you'll see it's 50m x 50mm. Let me know if you need a screenshot to save you clicking the link.